In filling out an Application to be part of The Best Little Bead Box swap, I needed to include a piece of mine that I was particularly proud of. Although I've gotten more advanced in my jewelry making/beading skills, I keep coming back to this pendant, made a few years ago, that I gifted to my dear friend, Gina. 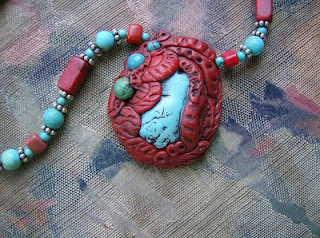 My goal now in my jewelry design, is to include some of my own beads or pendants in every thing I make. I have been a busy bee designing new bead sets and pendants. Stay tuned for pictures ... weather permitting. As for this necklace, the coral beads are premo polymer clay finished with acrylic paint, the pendant is polymer embellished with real turquoise. The necklace is strung with silver spacers from Rings N'Things.